It wasn’t until I was fully cooking, on my own, in college that I learned to love Red Beans and Rice, and under the guidance of my Grandmother I mastered the craft of building the perfect pot of beans. It was a lesson in the culinary arts, which stirred my desire for cooking and Southern food. The biggest lessons learned along the way were about seasoning and flavor profiles. 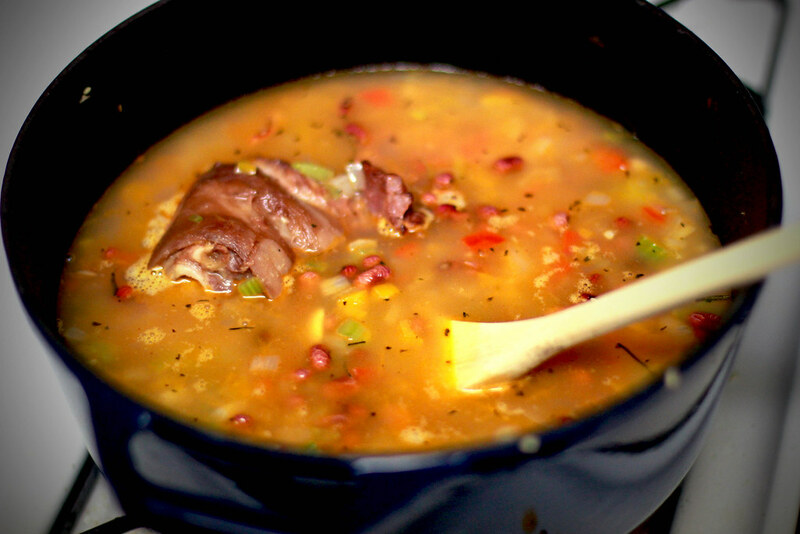 I quickly realized that simply adjusting the amount of garlic, changing the type of sausage, or cooking with a ham hock totally changed the overall quality of a bowl of beans. The complete flavor profile of the dish could be changed by adding or leaving out single ingredients, or completely ruined by over seasoning. I also truly learned what season to taste means, and how to balance the flavors of smoked paprika, cayenne pepper, thyme and Cajun spices. There is also that tricky maneuver of learning when beans are really done, and not just cooked . I actually learned to pick out a bean, pinch it and learn its done texture. I fully believe that if one can master Red Beans & Rice, you can master anything in the Creole Cookbook of Southern foods, and I’ve got my very own recipe and technique to prove it. Stay Hungry Y’all! Prepare the dried red beans by soaking them in water at least 8 hours before cooking, then drain. In a heavy pot, preferably cast iron, saute the vidalia onion, bell pepper, celery and garlic in a few table spoons of butter until the onion is translucent being careful not to burn the garlic. Add the salt, black pepper, cayenne, paprika, bay leaves, green onion & thyme and stir to combine. At this point you can add the chicken stock for extra flavor and stir (Chicken stock is optional, but does add a little extra flavor). Before finishing the saute, add the ham hock to start the fats warming to release the flavors into the pot for about 2 minutes. Add the red beans and cover with water and bring to a boil. Once the pot reaches a boil, allow to boil for 5 minutes, then reduce to a simmer. Simmer for at least 2 hours, then test the texture of the beans by pinching a cooked bean between your fingers making sure its not firm, the skin should fall apart and meat of the bean should mush apart. The consistency of the pot will take on the inner texture of the beans, very rich, brown,creamy and thick. You are looking to cook the beans till they are very soft, but not into a paste or soup. Prepare long grain rice according to package instructions. Once the beans are done, stir the pot dragging a wooden spoon along the bottom and sides to crush some of the beans, but do not go over board you don’t want red bean paste, (3 or 4 passes will do) then add the Tobasco and Tony’s. Chop the Andouille into preferred sized bites and saute in a pan till warm, or grill and serve whole pieces. 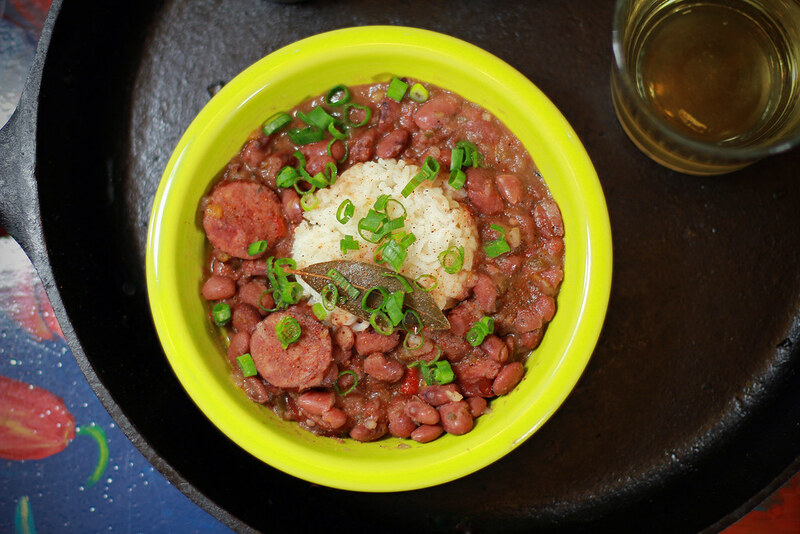 Serve the beans and andouille over warm long grain rice, and garnish with chopped parsley and remaining green onion. Add Tony’s and Tobasco to taste, with a side of warm french bread. Enjoy! It’s interesting to see different recipes from across the South. In our house you always use Camellia red beans, even if that means having them shipped to Chattanooga or Washington. We used water instead of chicken stock and always, always, the trinity meant a green bell pepper, never a red/yellow/orange. Additionally, to make the thick gravy, creamy texture we lightly press the beans to the side of the pot while stirring them during their simmer period. To this day, red beans and rise are my favorite food, hand down. I agree totally. I’ve come across all those techniques, and make red beans tons of ways. I typically use a green bell pepper, but occasionally like the different flavors of red or yellow. I’m with you on the camellia beans, I always use them if I can find them as well, but will settle as long as they are red beans and not kidney beans. Also…the chicken stock is not something I usually do, and have seen folks that are real heavy on the chicken stock, not a fan of to much stock. I typically just use water, but if I’m doing “Fancy” beans, I like a couple cups of chicken stock, tried it with seafood stock once, but that did not go well at all. I guess I should have clarified more about the bean texture, but I usually right at the end give the pot a hard stir dragging the bottoms and sides to break up some of the beans, but not to much. That’s what makes Red Beans such a great dish isn’t it, there is a million different ways to change the whole dish by doing simple little things, I guess that’s what I really wanted to convey. Thanks for the comment, keep the style articles going on your blog lovin http://www.southerngentblog.com/ . This looks great! It would be perfect with a big ol’ slab of cornbread! Yeah…my grandmother always served it with cast iron cornbread…guess I should have gone the next mile. 🙂 Red beans and rice are one of my all time favs! You did that recipe some justice…keep em’ comin’. Thanks! Great minds think a like, your shrimp and grits, are nearly identical to one of the ways I do it. We’ll have to swap secrets, I’ve got 25 recipes for shrimp n’ grits from all the experiments I’ve done with them. I’d be ok with that. Do you remember that time I tried to make them at your house and they over flowed on the counter…I think “K-Dog” got made. Nana’s Red Beans and Rice was might favorite meal that she made. I am soaking some beans today. 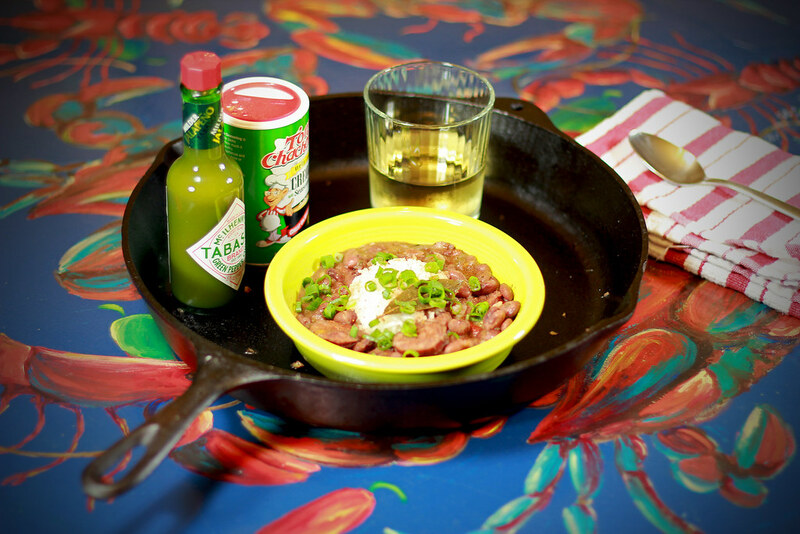 Thanks for including Tony Chachere’s in your recipe! What do you mean Salty? The recipe? Yeah I just realized that I had 2 tablespoons of salt in the post, it should say 1-2 tablespoons to taste. There is a good bit of salt in the Tony’s as well along with the hamhock. You should always taste before adding salt. Thanks for the catch. I’ll update the recipe. I love me some Camellia beans.